Knowledge discovery is the process of discovering new information. In text and data mining this happens for example by finding new connections or trends in a large amount of text and data. Ron Daniel is director at the Elsevier Labs. He explains Knowledge Discovery and Knowledge Representation in three short videos. How can Knowledge Discovery be described? 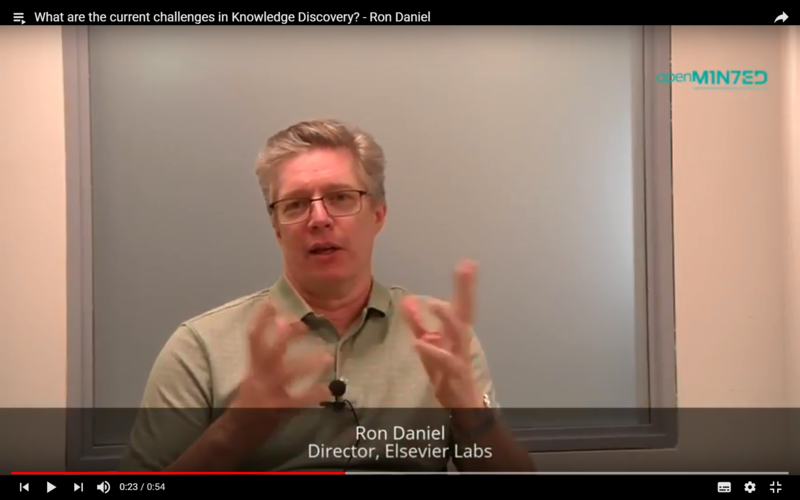 What are the challenges in Knowledge Discovery? How can you start learning about Knowledge Representation? Ron Daniel is the Director of Elsevier Labs, an R&D group which concentrates on smart content and on the future of scholarly communications. Educated as an electrical engineer, Ron has done extensive work on metadata standards such as the Dublin Core, RDF, and PRISM. Before joining Elsevier in 2010, he worked at a startup that was acquired for its automatic classification technology, and consulted on taxonomy and information management issues for nine years. Ron received his Ph.D. in Electrical Engineering from Oklahoma State University, and was a postdoctoral researcher at Cambridge University and at Los Alamos National Laboratory. Ron is bemused by the way technology reincarnates itself, specifically in the way that parallel implementations of neural networks for machine vision are currently in vogue, just as they were more than 20 years ago when he was working on them in grad school.